Want a fun summer manicure but think pink nail designs aren’t your thing? Miss Nail Addict, listen up. Pink isn’t what you remember from your very first manicure. There are many manicure types and designs ranging from minimal to maximal, sweet to spicy. 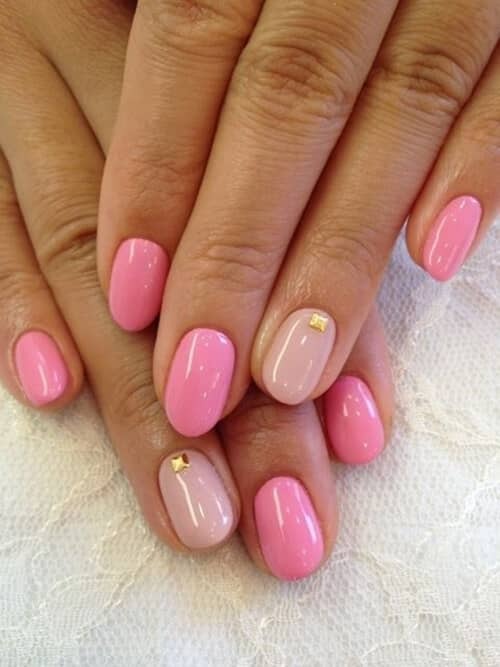 There are pink nails for you.Getting pink nail designs don’t have to be all bubblegum sweet. You can change things up to go from work to play in a matter of minutes. Add some glitter or white accents, and you’ve got the makings of a bold, fashion-forward nail art design. Pink nail color, really? Yes, really. Here’s an awesome nail polish idea. Pink nail designs can be a game changer if you combine the right elements for your manicure types. It transitions well from a trendy neutral to fun and bold glitter. Sometimes a neutral design means a boring flesh color. Instead of warmed over oatmeal or whatever flesh color suits you, choose a soft semi-translucent pink to stand in for your neutral. It’ll look great with your jeans and t-shirt weekend look or that tailored suit for your presentation. Get pink gel nails for a long-lasting design. Glitter is a girl’s best friend. Nothing pairs better with a sweet pink nail color than different kinds of glitter. Use silver glitter for a fun pop, but you can still take to work or your boyfriend’s parents’ brunch. 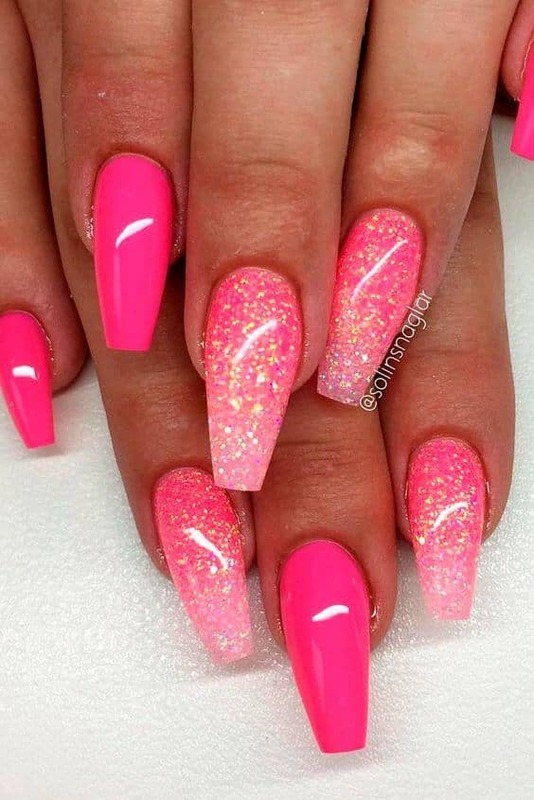 Use hot pink glitter for an awesome, summertime look. Use a bold rainbow or gold glitter for a nightlife designer nails look. Finally, should you go short or long? Nail lengths can sweeten up or brazen up a pink nail design. 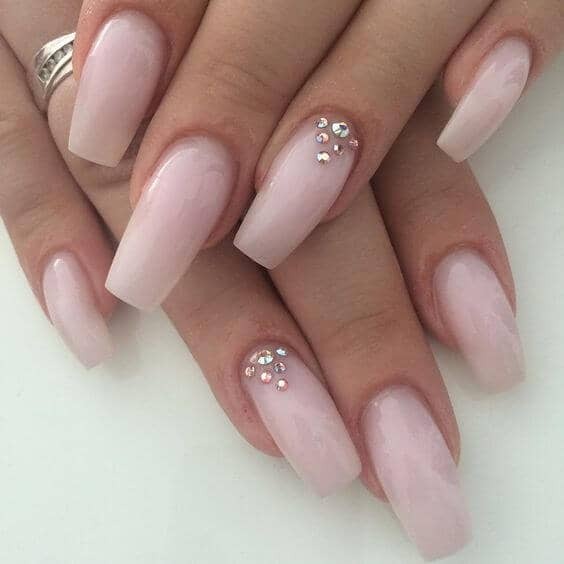 Keeping pink nail designs short lends them an innocent and polished look, especially if you keep the nails a soft square or gentle oval. 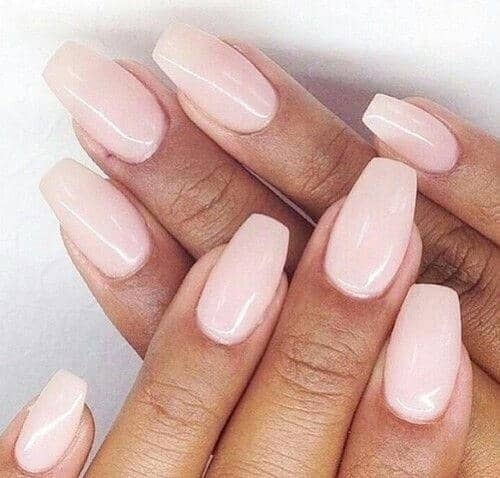 Long, square nails help a neutral pink design pop. They’re less precious and more grown-up; they scream you’ve got all your business together. They give a bolder but still subtle look.Long pointed nails with a pop of glitter or nail are a weekend or nightlife look. They’re bold and fashion forward. File them to a sharp point to remove any mention of “sweet” or “girly” from the pink vocabulary. We’ve got 50 of the best pink nail ideas for this year to give you artistic inspiration for your next nail polish idea. The little black dress might get all the glory, but the natural pink nail is the rockstar of the nail world. These short nails go from work life to nightlife without losing an ounce of style. They’re a grown-up dusty shade of pink that coordinates with both pearls and PowerPoint. Natural pink isn’t doing it for you? Maybe you want something fun, flirty, and fabulous. 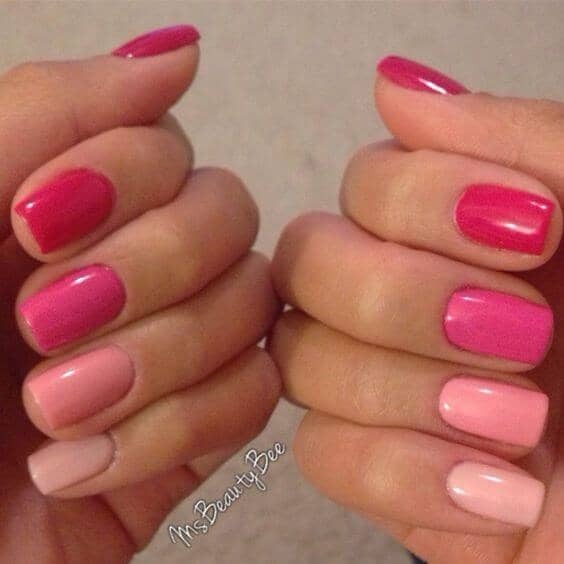 These pink nail designs are still a short design, but they offer a much brighter shade of light pink than the other nails. They’re the color of cotton candy, and their sweet design is perfect for summer. A long, cotton candy pink nail designs get a creative boost with glitter in this trendy design. Paint one nail with fun pearly glitter nail polish to catch light each time you wave down a cab or sip your latte. Finish the look with long squared off tips. It’s flirty but also a little fierce. 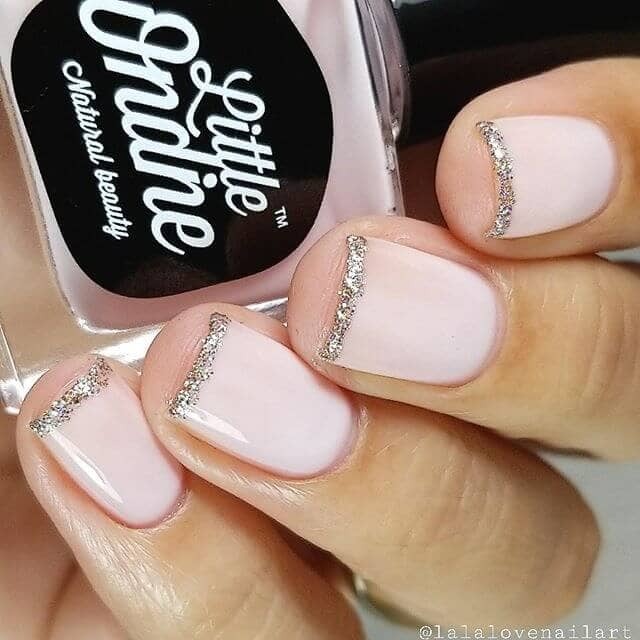 Soft, natural pink is the perfect complement to sparkly diamonds on the nail base. They keep their innocent look, but provide visual interest and catch light everywhere you go. They’re good for a formal event where you’ve got diamonds all over, or they can seriously church up a classic white t-shirt and jeans. 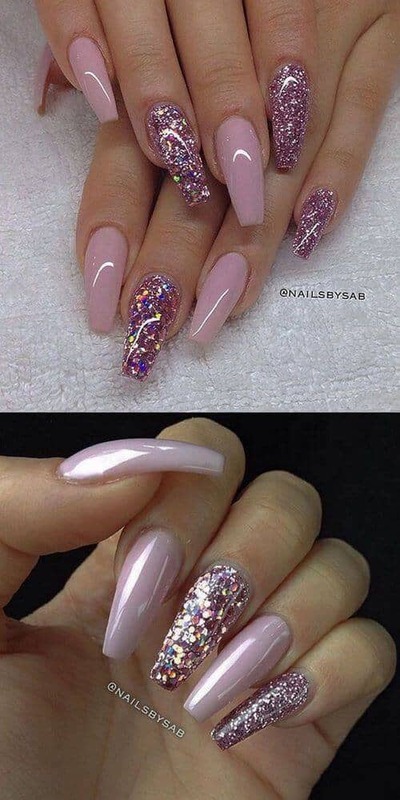 You liked the grown-up pink nail design in the first picture, but you don’t want to go traditional just yet. This manicure is a short nail design with a little twist on the pinky. It uses iridescent pink glitter polish to catch the light and give a small surprise when your hand moves around. There’s something about iridescence. It reminds us of bubbles or ballet costumes. Bring this airy design to your nails by using iridescent confetti decorations on the tips of your nails. The confetti fades into classic baby pink nails at the base. Keep the tips square for a polished look. Prom queens have all the fun. 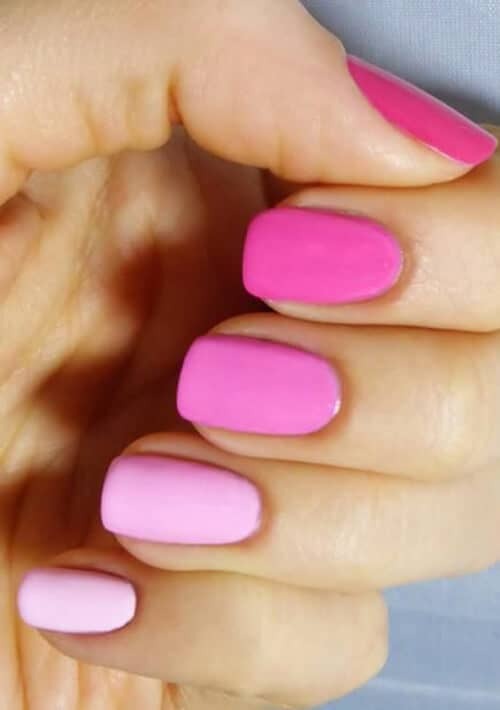 Use cotton candy-hued matte pink nails base for all the nails but the ring finger. On that nail use gold glitter for a striking contrast. For even more fun, splash a bit in the base corner of the pinky nail and cut your thumbnail into an interesting diagonal shape. Nothing traditional here. 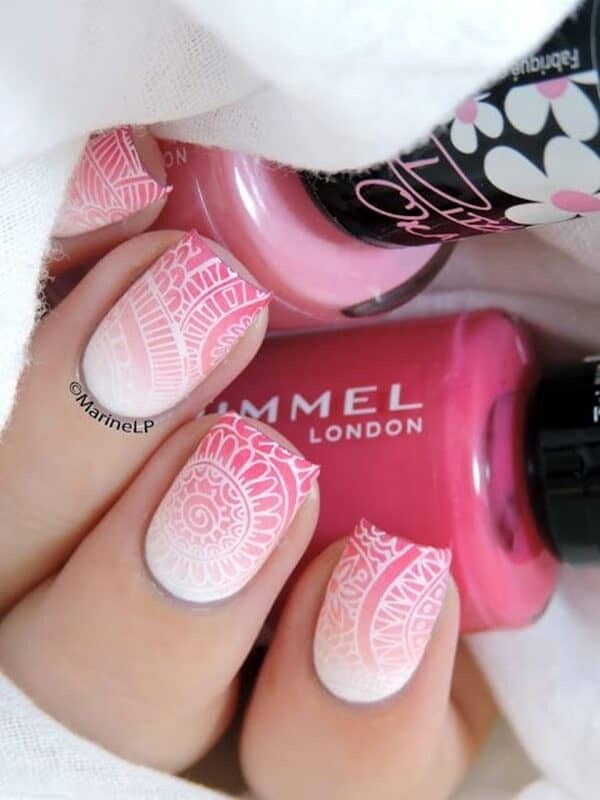 Make use of this trendy pattern by using a dusty pink on three of your nails. 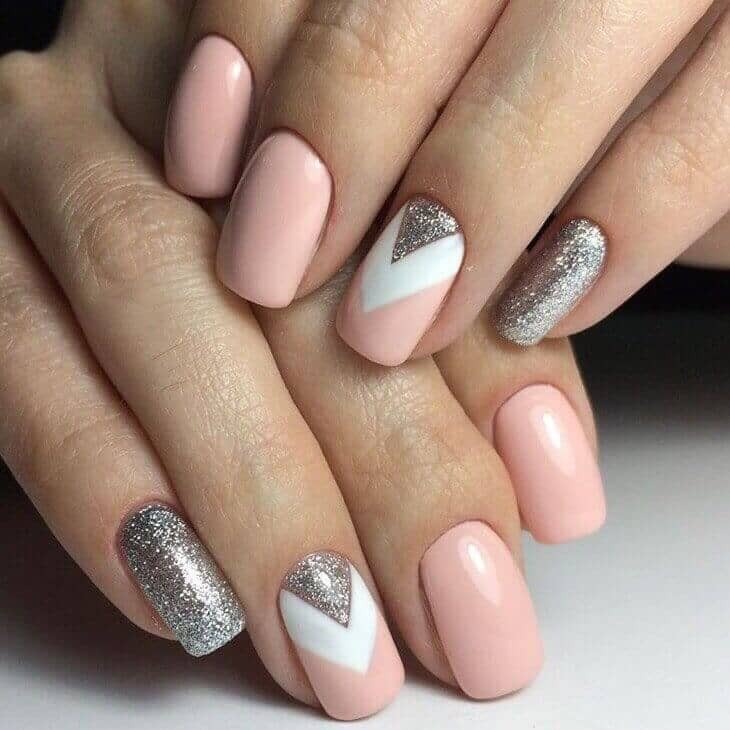 On the ring finger starting from the bottom, paint a silver triangle, a white border, and finish it off with the pink. On the pinky, use the glittery silver on the entire nail for a polished, but still fun design. Ok, no more playing safe. There’s nothing subdued or classic about these nails. Instead, they’re bold hot pink nails with creative gold and white splatter designs. They remind us of our sweet sixteen birthday, and just like that day, no one will tell us “no.” Keep the squared nails long for extra impact. Barbie would be proud. Use her signature pink shade on most of your fingernails, but keep the ring finger for a unique twist. A lighter, but complementary, shade of pink provides a base for a small gold rivet at the base of the nail. It’s structured, unexpected, and transitions well between your work life and your nightlife. Only two of the nail designs are exactly alike (pink). On one hand, there’s a black base with white hearts, Minnie offering a kiss, and a pink heart that makes up the sharp tip of the pinkie. On the other, there’s a white base with black hearts, Mickey offering a kiss, and a rhinestone design on the pinkie. Use the thumbnails to draw a bow for a sweet, coordinating different nail designs. Speaking of Minnie, take inspiration from her unique wardrobe with this cute easy nail design. 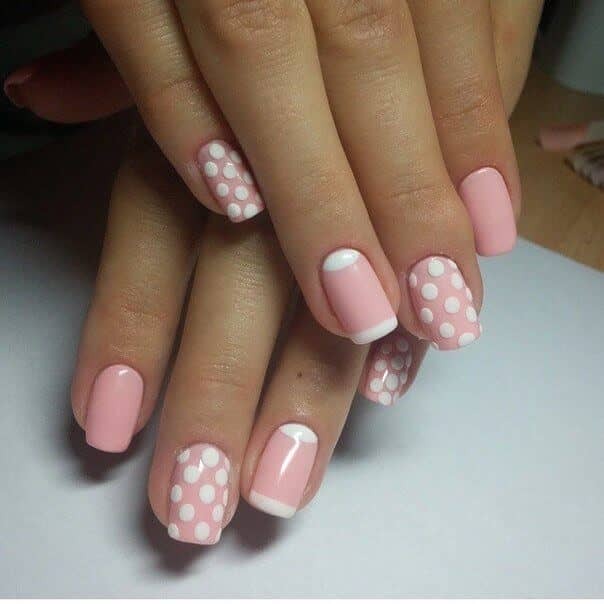 Two nails on each hand are painted in a pink design with raised white polka dots. One nail on each is painted pink with a white tip and a white base. The remaining nails are solid pink. Mid-length nails are a classic look that is popular for formal events where you need a subdued and put together look. 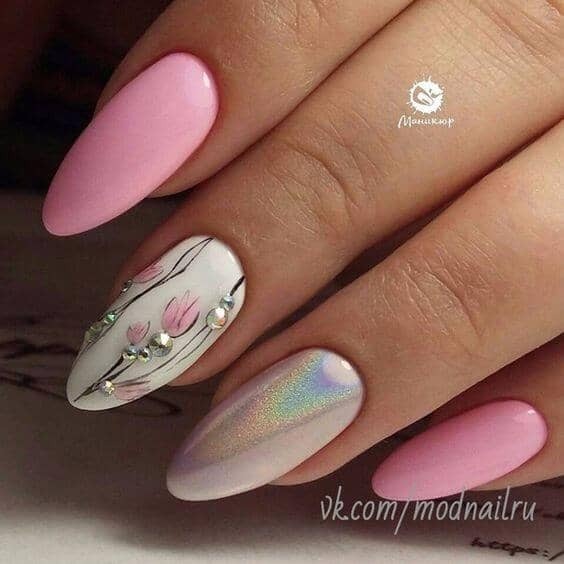 We could see these nails as a guest at a wedding or an important board meeting. The longer length is more trendy and feels less buttoned-up than a shorter version. 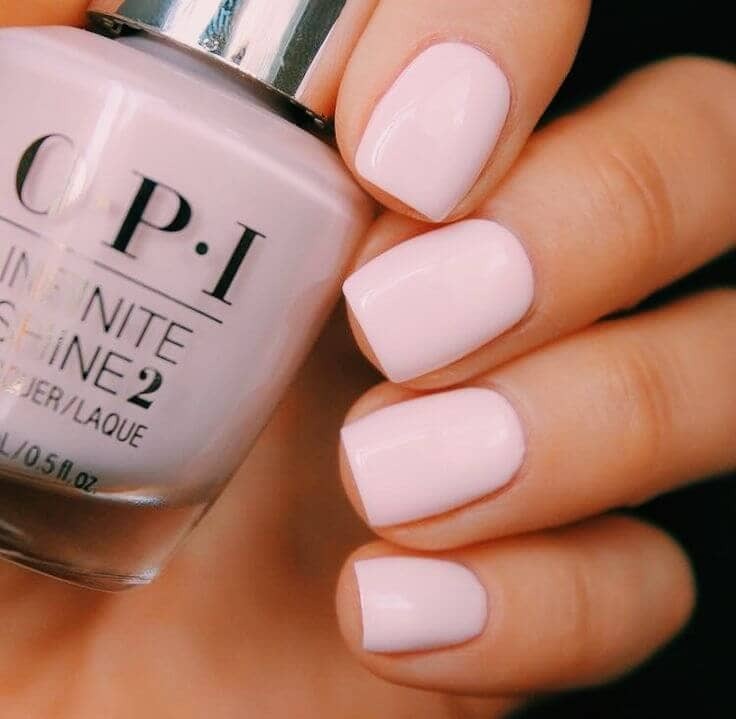 Shake up your pink manicure even more by using white to fade into the pink. Long pink nail designs give you plenty of room to fade from one color to the other. The white tips have a French Manicure feel, but with a trendy twist. Keep the pink ultra pale for the best effect. 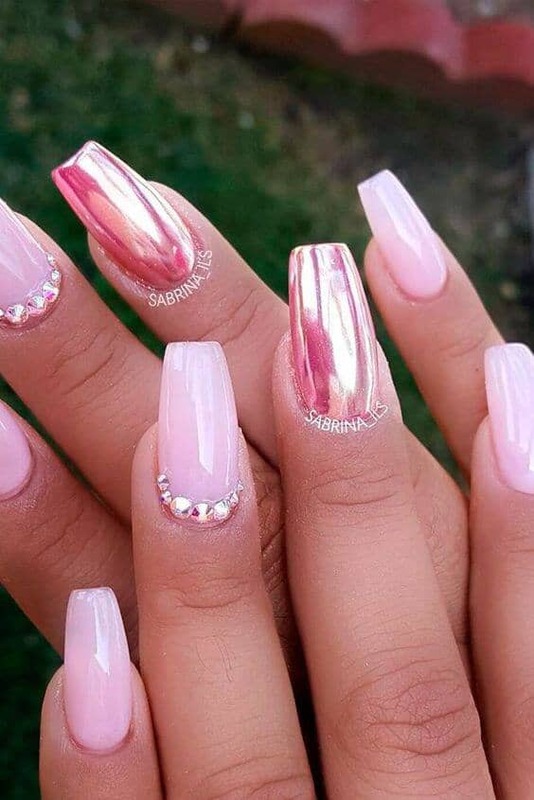 You want a cute, easy nail design, but don’t want anything too out there? Coordinating pink nails are a popular afternoon nail style. You can start with a dark pink on your thumb and use a successively lighter shade of pink on each nail. They all coordinate but you’ve got a fun, unexpected manicure. Mother of pearl is a luxurious material, perfect for an afternoon tea. 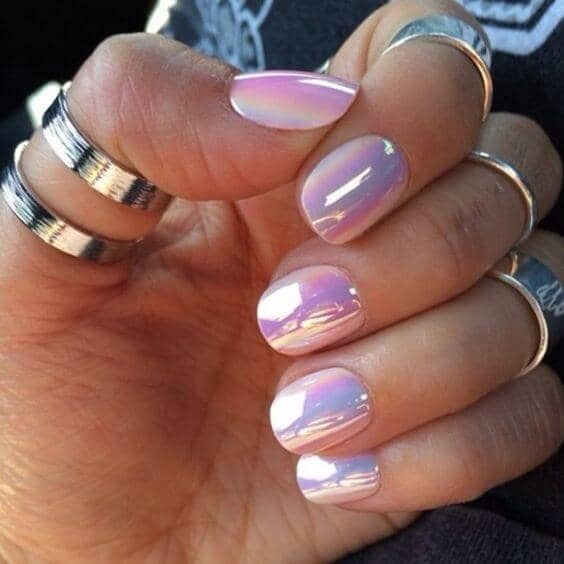 Iridescent shine is a cool complement to shades of pink. 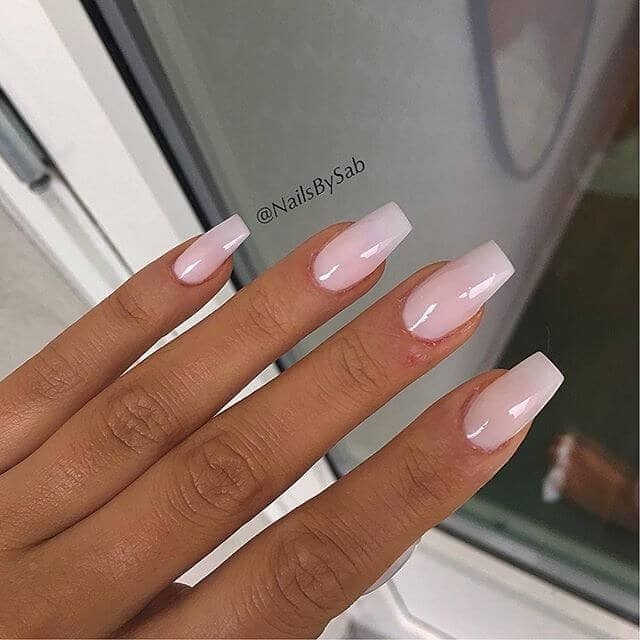 Keep the nails short like this example for a tailored look, or let them grow a little longer for higher drama. Each time your hand moves, you’ll catch the light. Like both edgy nails and fun girly colors? 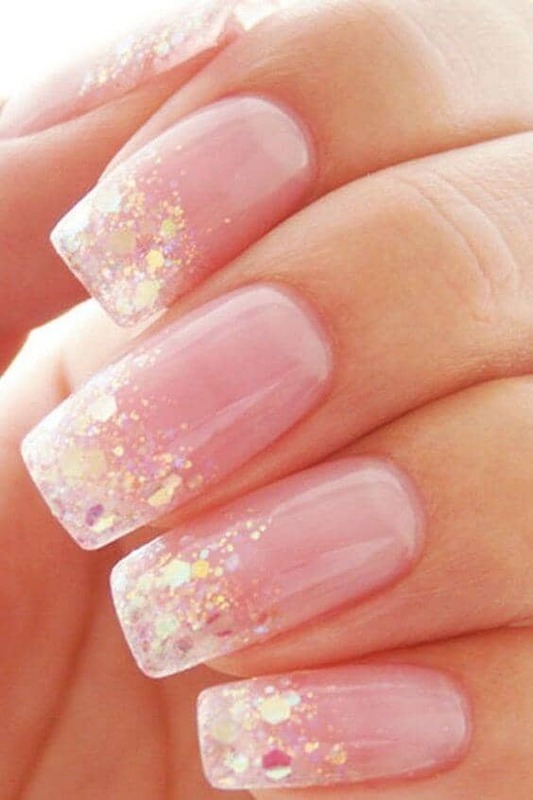 You can mix both styles by keeping your nails an extreme square tip but softening the look with a classic pastel pink. No sheer colors, just a cotton candy shade with a decent amount of gloss. It’s Barbie biker chic. You want all the things, pink, glitter, and rhinestones, but you still want a tailored look. 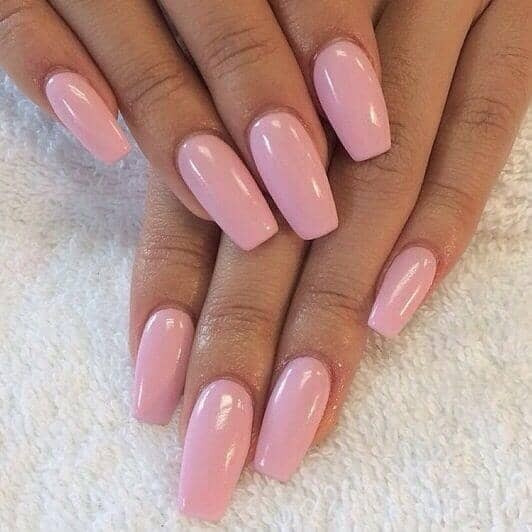 You can use a cool medium shade of pink with most of your nails. On the ring finger nails use a solid glittery silver. On the middle nail, use rhinestones down the middle to create a line between the silver and pink sections of the nail. These nails aren’t going to cause fireworks, but they are a solid manicure choice. They’re simple and classy, plus the pink won’t show wear and tear the way more complicated manicures might. They’re a good option for a hard week at work, but you still need to treat yourself. 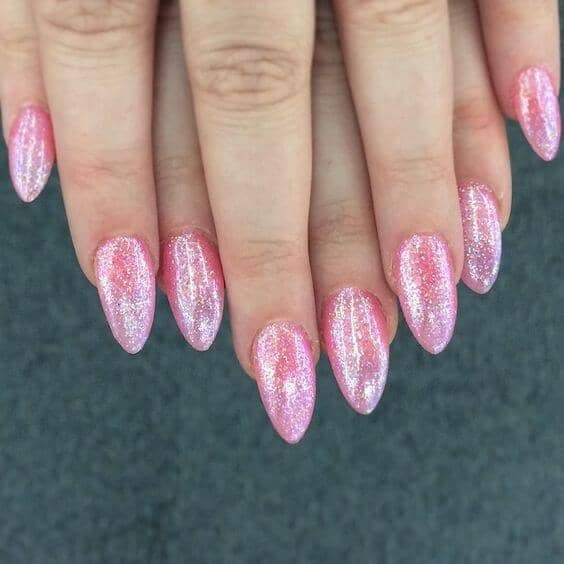 Long nails look great with pink nails and glitter. Pink glitter nails are a fun throwback to the glory of the disco era. Use polish with big glitter pieces for visual interest, and keep the nails long for high impact style on a sweet color. It’s both timeless and trendy at the same time. Hot pink is a great starting point for a gradient color scheme. Hot pink is a bold choice, but you can add a fun touch for your manicure by gradually changing the colors from darker to lighter. It brings all those summer memories to the forefront. All the fun with none of the responsibility. Soft tutus, ballerina slippers, the graceful movements of dance on the stage. Ballerinas capture our imaginations and our hearts. 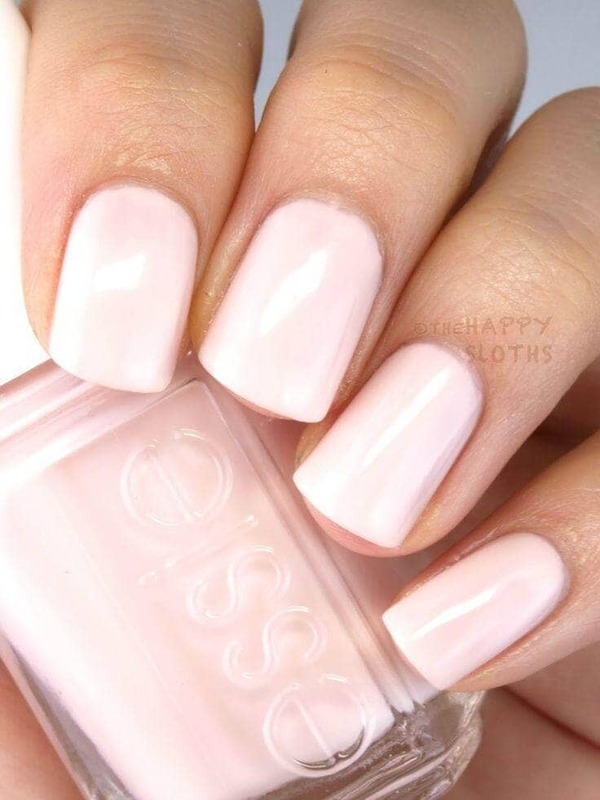 Bring all that grace to your style with these pale pink nails. Keep them opaque but soft with a light bit of gloss. It’s a simple, classy, and beautiful design, just like the prima donna. There are a few different versions of monochromatic fades, but this one uses progressive levels of iridescence for high drama but is subtle enough to transition well to work on Monday morning. It’s both classic but gives you a little bit of flair to take all the way to the weekend. 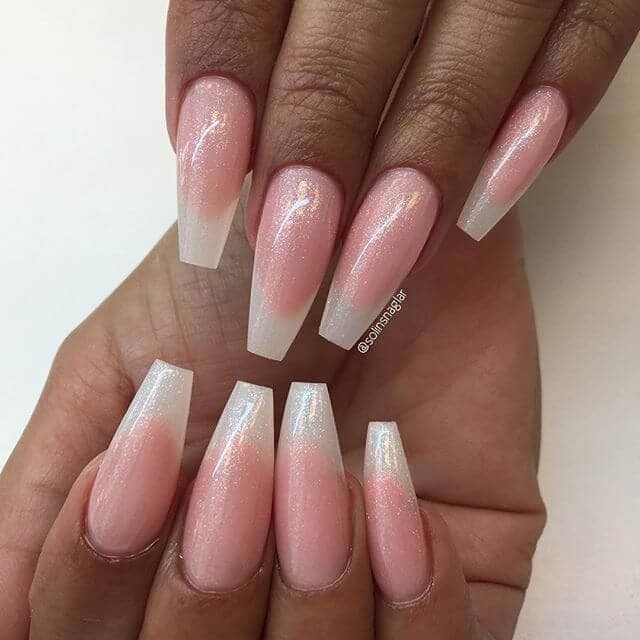 Long nails look dramatic with a nice square tip and a medium length to long nail. It has a refreshing pop of color just like the pink of a diner waitress’s uniform. It’s bold but not too severe. Make sure to keep the length long so that it doesn’t get too precious. 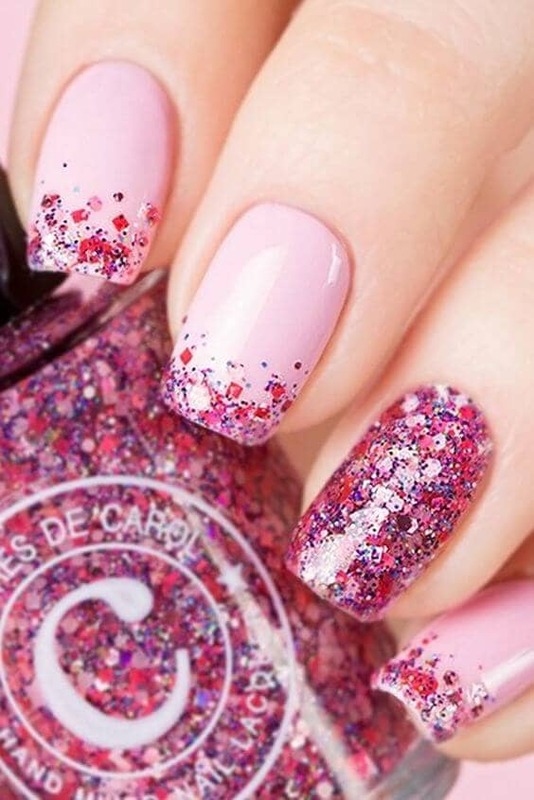 Glitter and pink are perfect complements to each other. Take advantage of how amazing they look together by combining them for a dramatic pink manicure. Paint the last nail with complete glitter. 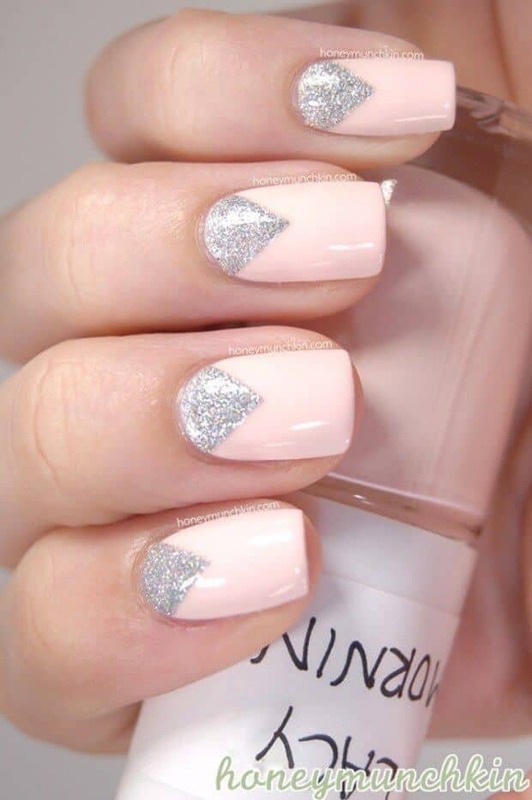 On the other nails, use a combination of pink and silver glitter on each nail in a graphic triangle. On the last nail, paint only pink. 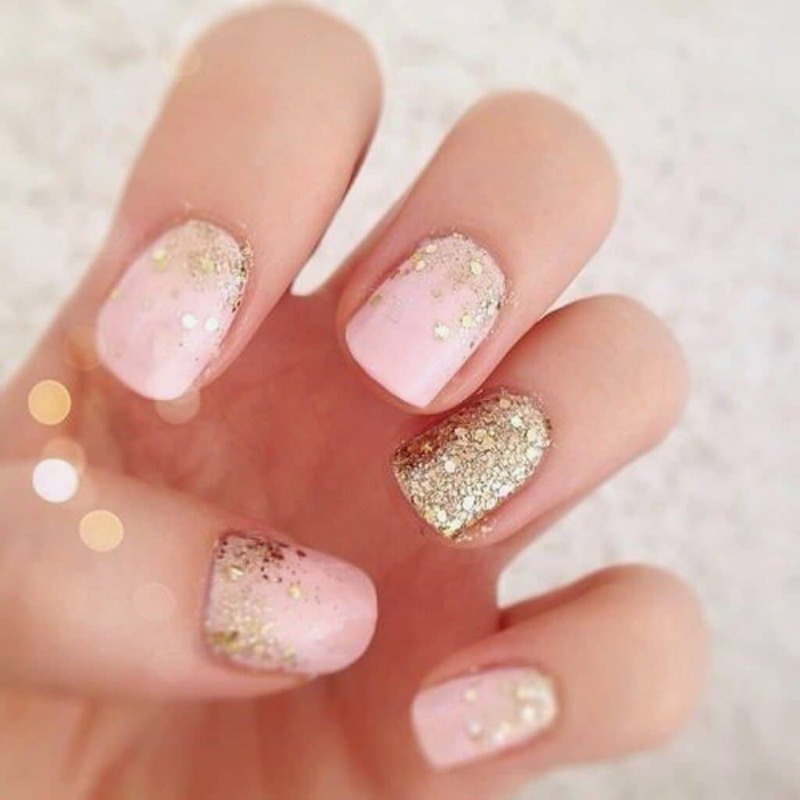 Gold-flecked nails are such a trend right now, and pink and gold nails are even better. You can get this look by using a pale pink and a polish with large gold confetti flecks. Paint the ring nail with a luxe solid gold but use the other nails as a foil for your gold nail. Use a pink base and a gold triangle to add visual interest and high drama. The silver glitter looks great on the base of the nail. A cute triangle accents the soft curve of the tip. Keep the nails short to avoid looking too precious, but overall this is a clean, tailored look. It’s a good transition manicure for when you have important work, but you also need a night out with the girls. There’s little that’s more fashionable than a classic french manicure. 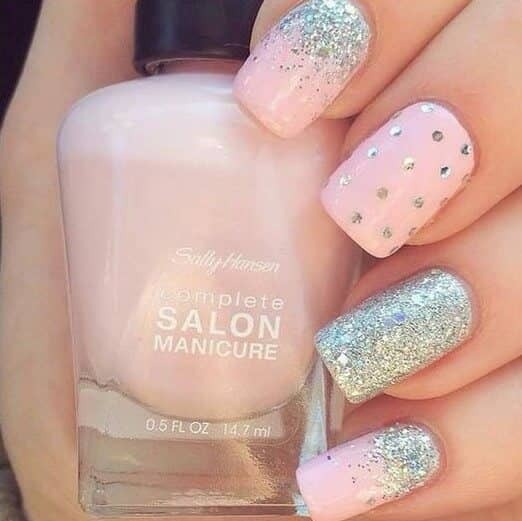 Give it a little twist by using a simple pink base coat but replacing the white tip with trendy silver glitter. It’s a cute little twist but still retains all the Audrey Hepburn glamour of old Hollywood. Keep the pink manicure from getting too cutesy by keeping long nails filed into a square tip. It’s a good balance between the trendy longer nails of 2018 and an ultra-classic pink. You don’t have to give up all your trendy style just to keep your lucrative job. You can blend the two into a highly fashionable manicure. Sometimes, you need to go all out for fashion. 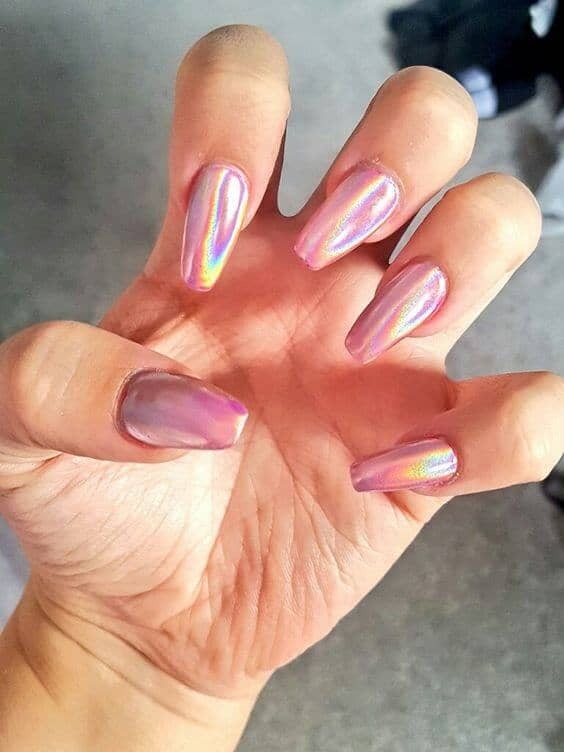 This year’s chrome nail trend looks outstanding with pink tones. 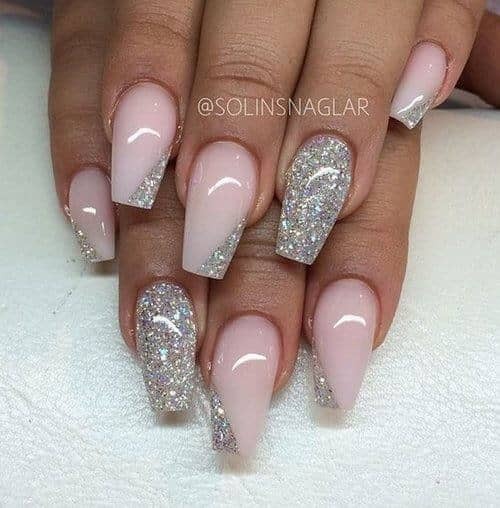 Go all out and keep the nails long for a high drama and on point trend. There’s nothing subtle about these nails. They are a bold choice and a great way to show the world your unique personality. If you want something more tailored, but don’t want to give up your glitter, you should use a monochromatic color scheme. 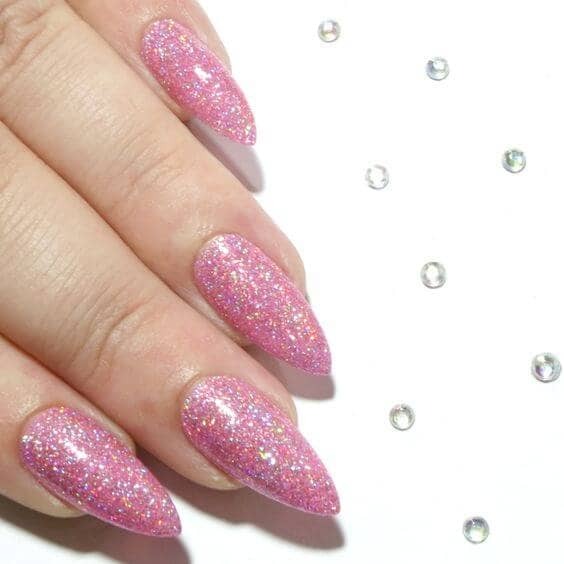 Large pink glitter at the tips of the nails fades into the same shade of pink but in an opaque shade. 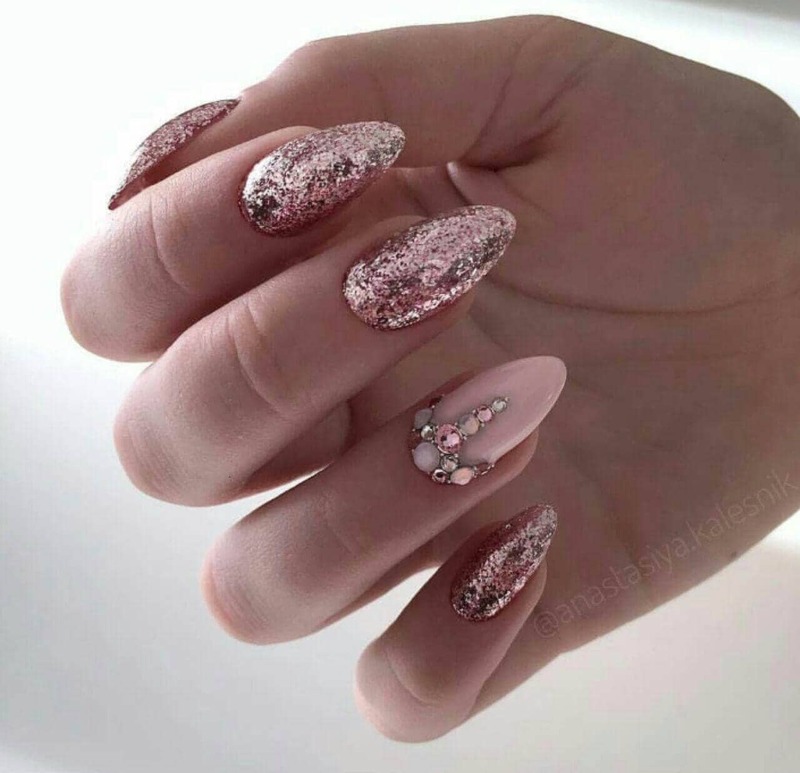 Pink glitter nails are a beautiful trend best kept on short nails for the most impact. Imagine those beautiful fabrics from far away places. Take that design to your nails by using pink and white base colors in a gradual fade. On top of the fade, use a slip paint pen to get beautiful flowery designs inspired by batik prints. Or you can go the easy route and have them done for you by a professional. Exotic and classy. Can you smell the sweet aroma of a garden of roses? This beautiful manicure is inspired by those very gardens. Use a pastel pink base on most of your nails, but on the accent nail, use a white base to complement the flowers. Use simple rose patterns to complete the design. Pink manicures might not seem like a bold design choice, but you can make dramatic manicure choices even if your favorite color is pink. This manicure uses chrome accent nails and a little extra drama with rhinestones across the base of the next nail. As a base color, the design uses a sweet, classy pink. These nails are a bold, trendy choice. 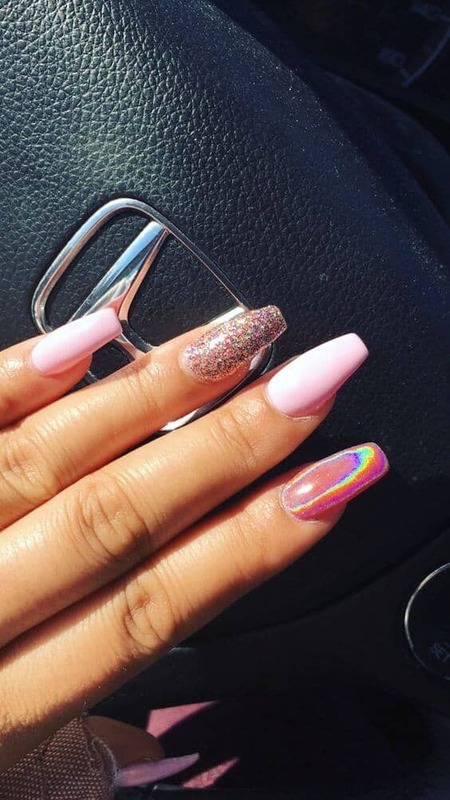 Leave the nails long but make sure the tips are squared off to follow 2018’s best nail trend. The mother of pearl design uses hot pink shades to give the nails a shimmery, girly shine. It’s ultra-fancy without being too formal. We can’t get enough of glitter. This fancy pink confetti style glitter is one of our favorite basic designs. Use this classy but still fun pink glitter polish as an accent to the perfect soft pink. You can bring glitter into a manicure but don’t have to go all out if you need to transition from work to night time. Glitter and chrome are some of the hottest trends in nail art for this year. If you thought it might be too much to combine both in the same manicure but chrome and glitter look amazing together. Pink shades of both glitter and iridescence help coordinate the whole look. 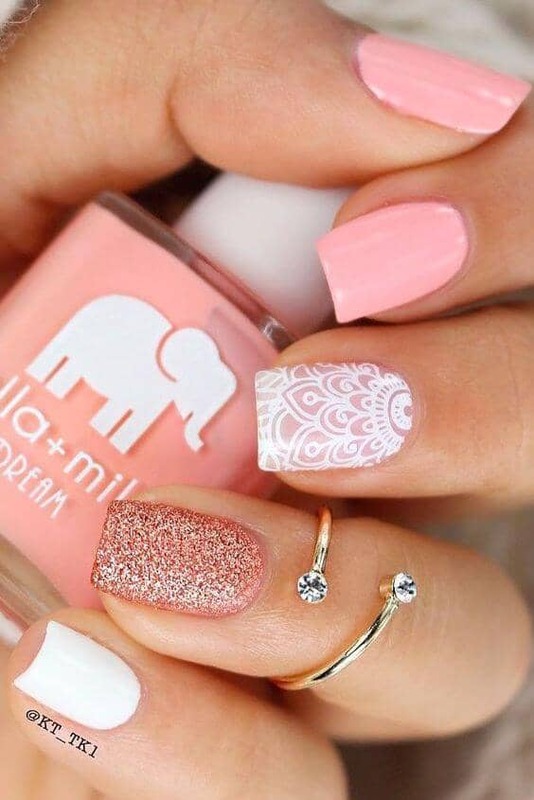 Use a plain pink base on the other nails to tie the whole look together. Bold choices and bold style. These nails all have different types of designs. Some have rhinestones. Others have chrome inspired pink shades. 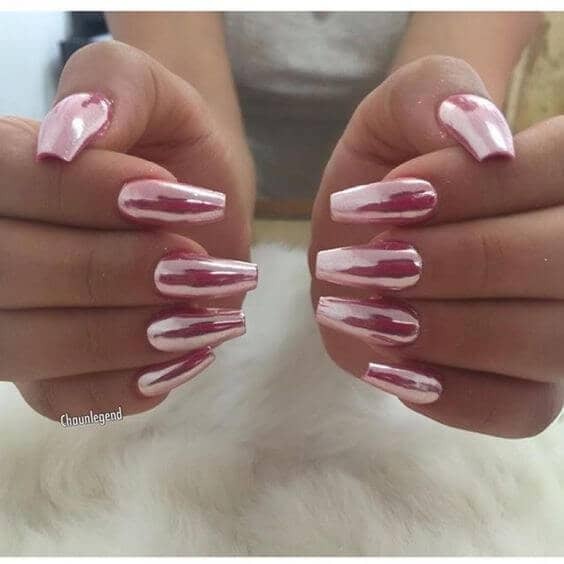 There’s even a sweet heart done in pink and white on one nail and roses on others. Everything is done in complementary shades of pink and white, so it all coordinates well. Neutral has a bad rap for being boring, but using a light pink comes off as a neutral without fully giving up your style. 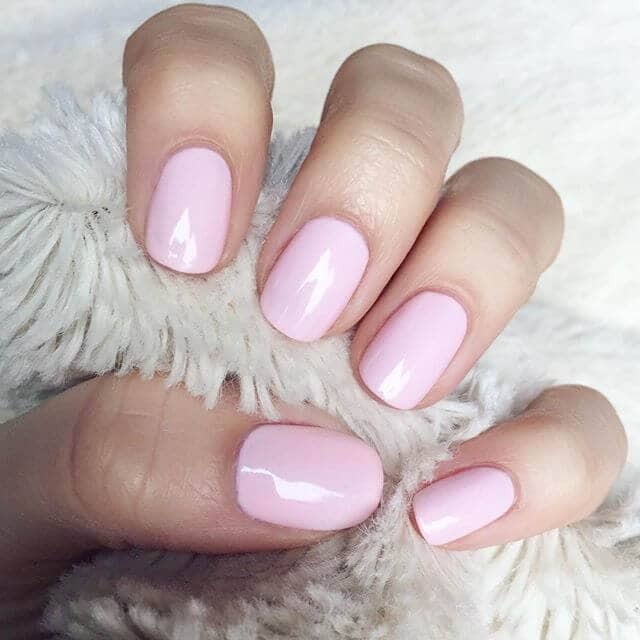 This pink is pastel and has a little translucence, so it works well as a simple, minimalist manicure for times when you need to be low key but don’t want to sacrifice any of your style. Pointed nails are a super trendy design. They take the sweet look of pink and toughen it up a little. Glitter adds a little fun. The entire manicure is a bold fashion choice and a fun weekend style for high drama. This isn’t your typical pink nail. It’s a bold and fashion forward. Simple manicures are timeless. 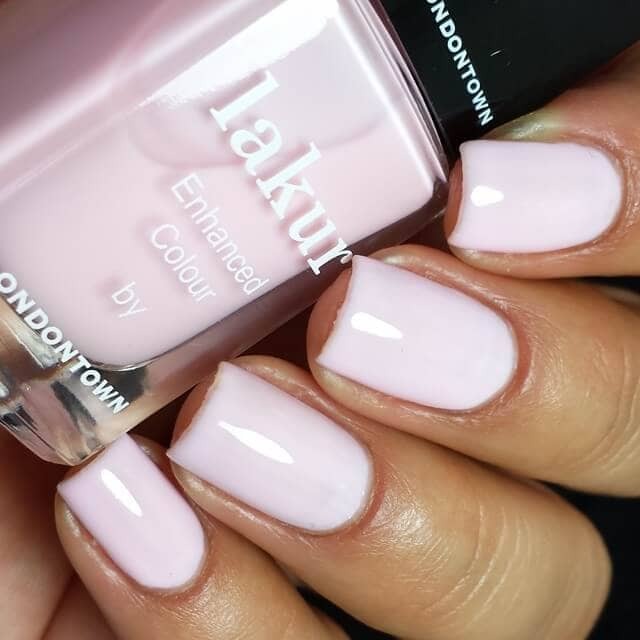 This manicure uses a timeless shade of pastel pink in an opaque tone with a slight gloss. It’ll wear well even if you’ve got things to do before your next manicure. It’s a good basic manicure to use when you’re in between designs but still need something classic and beautiful. Hot pink glitter? Check. Bubblegum pink? Check. Combine them on alternating nails for bold visual interest. 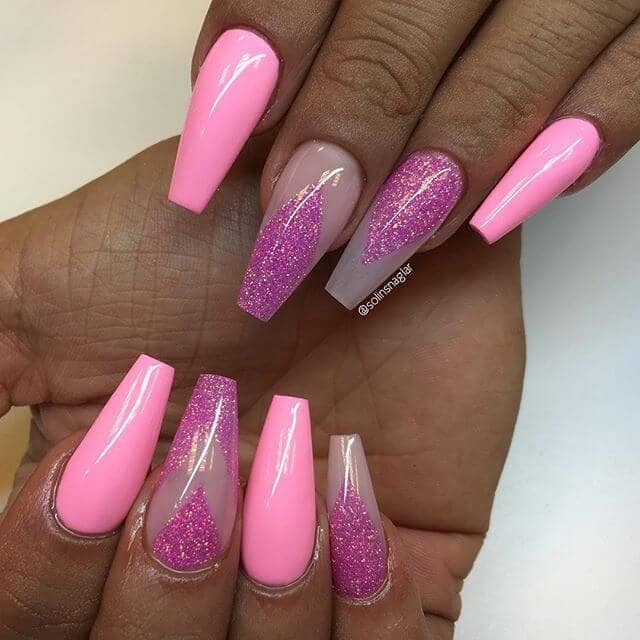 Use solid pink on half of your nails, but the others have a pink glitter accent with sharp points. Use simple, clear acrylics as the base for the glitter base to keep everything coordinated. Stripes are so trendy right now. This is a great manicure for some flair, but it blends easily with more formal looks. Thin silver stripes across one white nail are a tailored look. One glitter nail adds some fun. 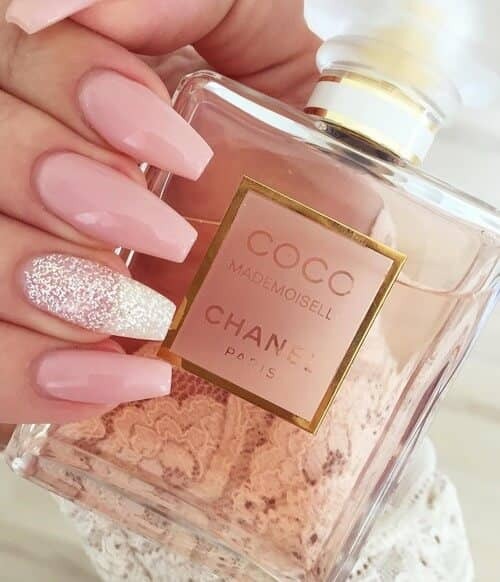 Pale pink nails tie the whole look together. It’s both flirty and formal, traditional and fun. Glitter, glitter, glitter, and then add some more. Just in case glitter isn’t enough, add some rhinestones for 3D sparkles. Oval shaped nails finish the design for a classy but show-stopping look. This is all out glitter plus extra sparkles on top. It’s the princess tiara of nails. 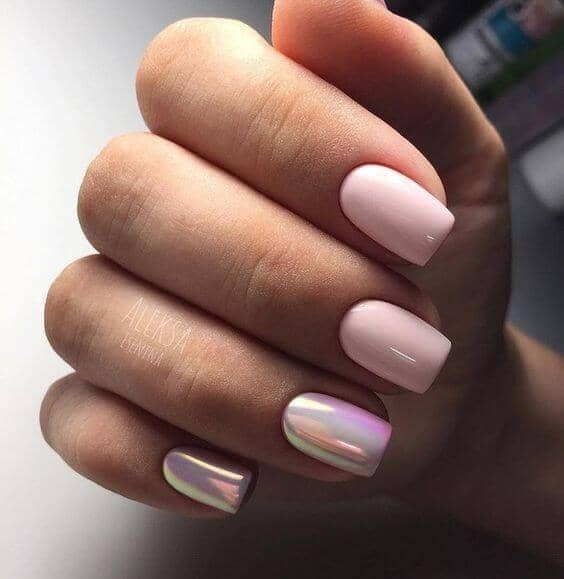 Pink and silver nails are a classic combination. 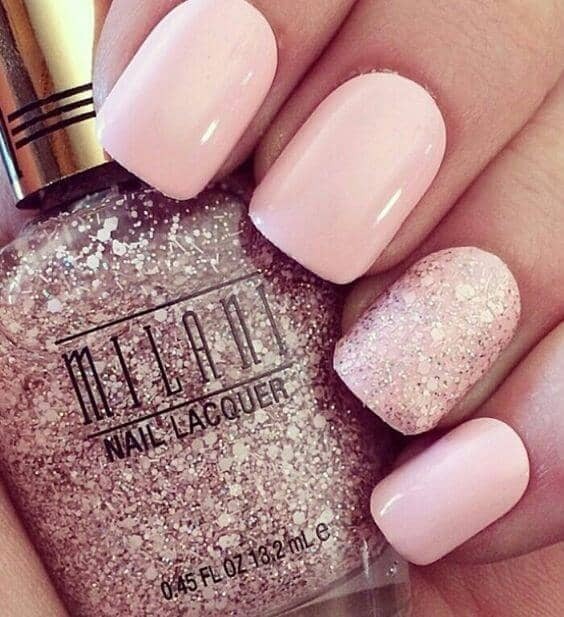 Add some sweet sparkles to a soft pink manicure. Give it some visual interest with a single nail full of silver polka dots. Paint the adjacent nail with full sparkles to catch the light. Splash the other nails with glitter at the base to bring the look together. Bubblegum pink makes a perfect partner to delicate petal nail designs accented with rhinestones. Use minimal Japanese inspired floral art to create simple flowers on a beautiful white base. Accent the flowers with tiny rhinestones. Use a simple shimmer to catch light and sparkle whenever you move your hand. 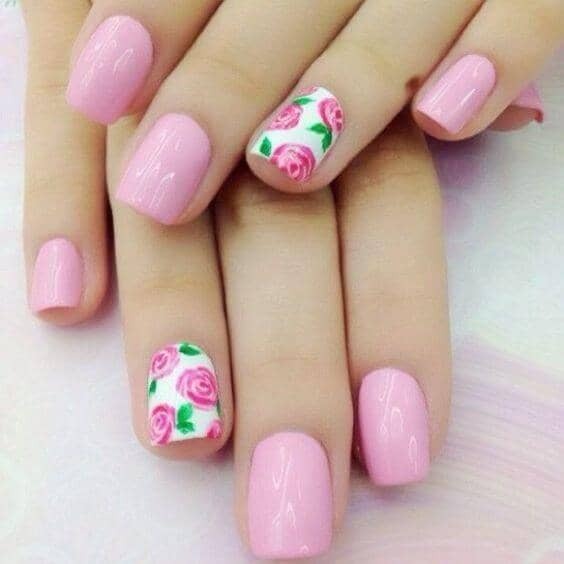 Keep the nails longer and rounded, mimicking the lines of the flowers. Love the pink trend but need a twist? Use a peachy pink color for a beach feel. Use white henna inspired flowers on the accent nail for a fun twist. 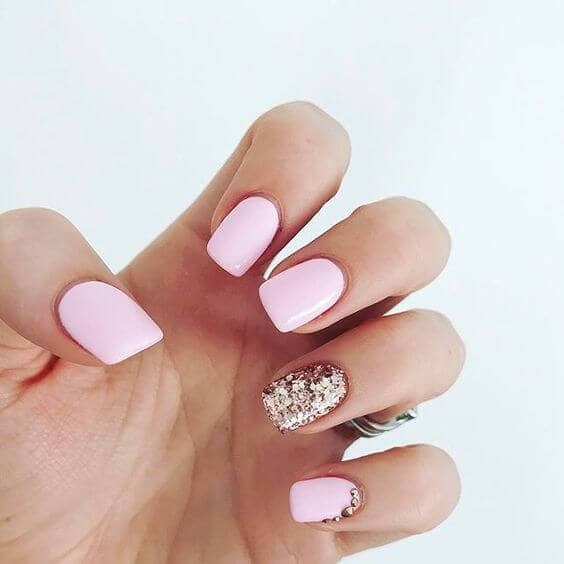 As a final touch, use pink glitter on the ring nail for fun sparkles that transition from fun at the beach to a night out. Hot pink glitter is fun and flirty. Long nail designs are bold and vibrant. Combine the two for a dramatic, fashion-forward look. Hot pink glitter with a rainbow shimmer is a really fun choice. If you file the nails to a point sharp enough to draw blood, it’s a compelling fashion choice that tempers the sweet, girly glitter. Pink jawbreakers and lollipops. Fun, bright summery colors. All the carefree pieces of summer in a manicure. Use chunky hot pink and purple glitter on the tips on top of a base coat of cotton candy pink. 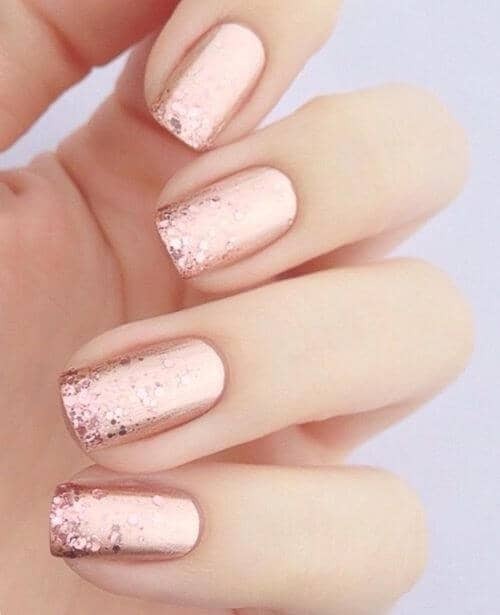 Use the glitter on one entire nail for a fun accent. No responsibilities. No paperwork. No bosses yelling. Just convertibles and the magic of summer. 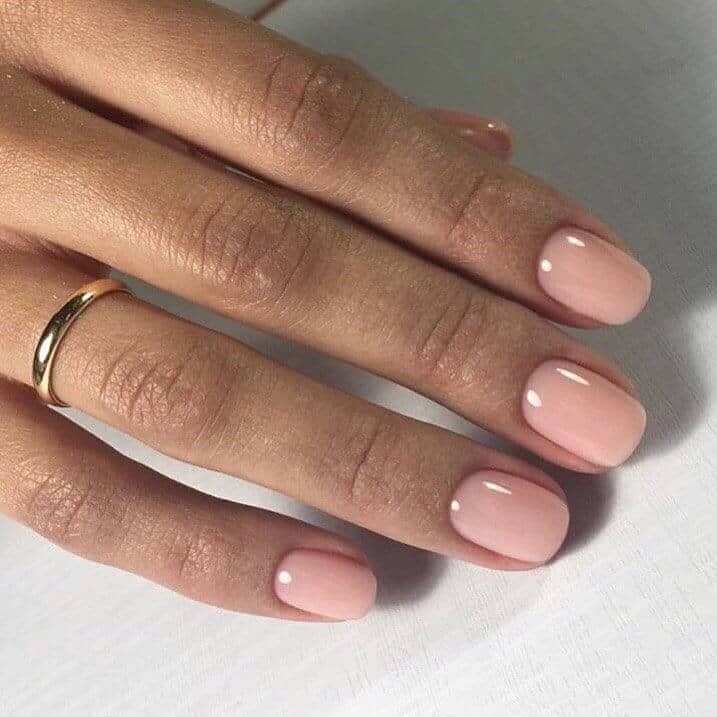 Pink is a summer color, but when the colors change you can transition your manicure to the fall with a soft neutral pink. 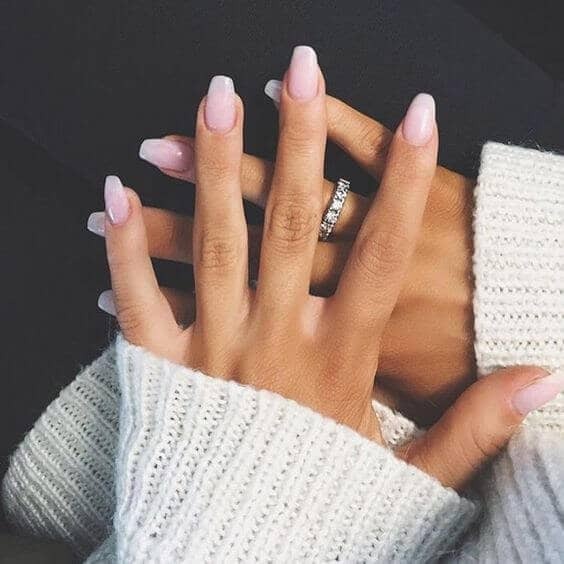 Light pink acrylic nails at a medium length with a soft squared tip are a classy, comfortable, sweater weather and bonfire manicure suited for the soft change and slowing down of seasons. Pink isn’t just sweet. 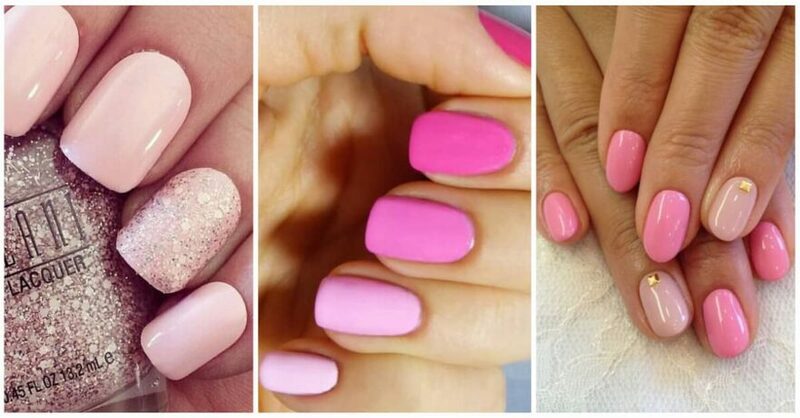 There’s a lot you can do with pink manicure nail ideas if you’re a nail addict. You can go completely neutral or all the way out to fashion-forward, designer nails. You can get pink gel nails for a long-lasting design. Use each of these pictures as inspiration for a manicure that suits exactly what you need. Pink and gold nails, neutral pink, or a sweet flower nail art design. 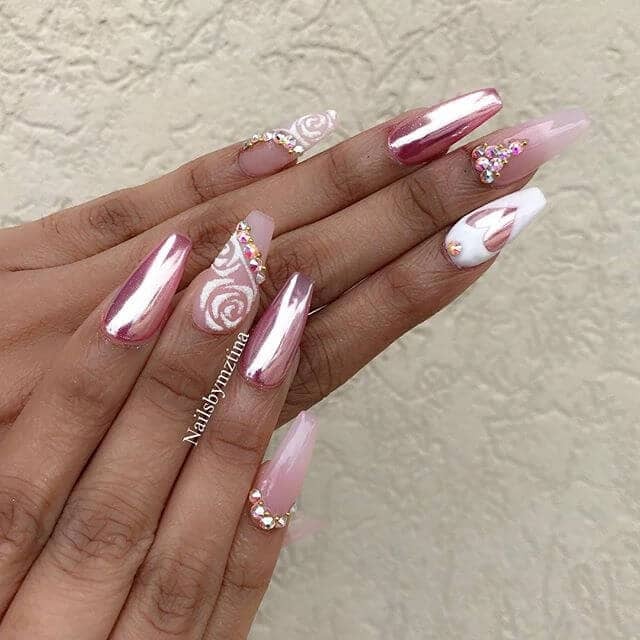 Different nail designs all amazing and there are perfect nails for you.